Analyzing athletes’ body composition can lay the groundwork for diet and lifestyle interventions that boost lean mass, reduce fat, and ultimately improve both performance and health. By Amy BraggAmy Bragg, RD, CSSD, LD, is in her sixth year as Director of Performance Nutrition at Texas A&M University. She can be reached at: braggamy@hotmail.com.Whether they’re on the field, court, or track, coaches use a mix of art and science to measure their team’s gains. They combine observations with game statistics to figure out where the team needs to improve.Strength coaches often do the same thing in the weightroom. By watching athletes work out and periodically testing them, we can determine how they are progressing.Recently, many athletic programs have added another tool for assessing athletes: systematic body composition testing. Here at Texas A&M University, we regard individual and aggregate team body composition data as essential in evaluating nutrition outcomes and their impact on performance.In some ways, body composition analysis seems simple. Decreases in body fat and increases in lean mass mean the athlete’s conditioning has improved, and thus he or she is making progress. But the numbers themselves don’t tell the whole story. Analyzing the scores correctly and providing the right advice is what makes the testing worthwhile. A decade ago, body composition was usually measured using calipers. Today, we can also choose from a Bod Pod, underwater weighing, bioelectrical impedance analysis, or dual energy x-ray absorptiometry (DXA), which is what we use at Texas A&M. The x-ray provides bone mineral density (BMD in g/cm_ along with T-scores and Z-scores) plus quantified total mass, lean mass, body fat, and bone mass expressed as bone mineral content. Regardless of the method, there are many ways to use the results. A major benefit of body comp testing is that it builds confidence in the training and nutrition plans we provide for our athletes. When hard work results in increases in lean mass, athletes buy into our expertise and the program as a whole. Your school’s nutrition expert should be responsible for testing and communicating results to student-athletes, as this helps reinforce the significance of nutrition for athletic success. The results also provide a form of motivation. We know proper strength and conditioning requires intensity in the weightroom. The variables with collegiate athletes are often nutritional consistency, timing, and food choice. Working toward a specific body comp goal can keep the competitive fires stoked through grueling workouts and challenging eating plans. For those student-athletes who require extra motivation to ensure success, frequent body composition measurement can keep them on track toward their goals. The incremental feedback reinforces the importance of good decisions and demonstrates that poor nutritional choices carry a heavy price. If an athlete is getting off track or losing steam, an extra body comp test can help push them back on the path to success. We often use body comp analysis in different ways for different athletes. For those with very poor eating habits who need large improvements in body comp, we’ll focus on the basics. We provide nutrition education and counseling and they are able to see their numbers change fairly quickly. For the athlete who has naturally ideal composition, we’ll take a more detailed approach. We talk about improving lean mass and how small, incremental changes can make a difference. We’ll coach for a positive change in lean mass, explaining how this will help him or her be more explosive, more agile, and stronger. Fuller said he learned a lot through A&M’s focus on body composition. “There were a lot of things I thought were good to eat, but really weren’t,” he continued. “When you go to Subway you think you’re eating healthy, but that’s not necessarily true because of all the condiments and bacon and cheese and stuff you can get.” Jeff’s results at the end of the 2009 off-season showed an all-time high in lean mass, along with well-maintained body fat and overall weight. For weight-sensitive athletes, especially those in aesthetic sports, testing results can show positive trends not apparent on a bathroom scale, which is integral to building and sustaining healthy training and eating habits. “The success story I see most often is the athlete who has been asked to lose weight for performance benefits,” says Ruth Taylor, MS, RD, CSSD, Sports Nutritionist at the University of Georgia. At the same time, it’s critical to red flag any athletes who treat body fat measurements as a point of obsession, which can indicate or lead to an eating disorder. In these instances, we stress that body composition is great feedback, but not the only measure of performance. For their own health and safety, results may be withheld from these athletes on occasion. A great way to begin the discussion with an at-risk athlete is to ask something like, “Based on your training and eating, what are you expecting from today’s body scan?” Obsessive athletes never give themselves credit for good eating patterns–they only think about their indulgences. Sharing positive results reinforces moderation and a constructive outlook on nutrition and training. In fact, to prevent overvaluing body comps, we do not share results with student-athletes until we have two scans to compare. The body composition or body fat percentage “magic number” doesn’t matter nearly as much as the trend, or the change over time. Handling results in this manner is consistent with our educational message and frames the results in a realistic, healthy way. To best manage those who overvalue the tests, we continually monitor body comp to ensure body fat does not trend dangerously low, and reinforce the message that zero body fat is not the goal. If athletes don’t receive education and reasonable goals from professionals, they turn to less credible sources of information. We do, however, use the initial body composition scan as a screening tool for disordered eating. Nothing illustrates compromised nutritional intake quite like bone density. Using the volume of scans we have collected since early 2006, we’ve compiled bone density standards for each team and even some specific positions (see “Sport by Sport” below for some examples). When an athlete’s initial scan results are significantly lower than our team index, we follow up with a full nutritional assessment and appropriate calcium and vitamin D supplementation. Scans may be repeated to assess progress and changes in bone density and overall body composition. Another reason we do body comps is to develop a rapport between the sports nutritionist and student-athletes. Every Texas A&M athlete undergoes a body comp test, followed by a meeting with a nutritionist. This frames nutrition as a factor in performance and eliminates the “punitive” perception that may arise from referring athletes to the nutritionist. Too often, athletes perceive a referral for nutrition consultation as something for the “problem” athletes, the “big guys,” or eating-disordered athletes. When everyone meets with the nutritionist, nutrition becomes a coaching point for all athletes and another element in optimizing sport performance. Regardless of how you use body comp testing, the key is to provide clear nutrition advice along with the numbers. The most disconcerting situation for a student-athlete is body composition assessment without personal feedback and actionable tasks. This feedback should include perspective on the individual’s development, nutrition coaching, and practical strategies. • Probe current nutrition habits and find small places for improvement. 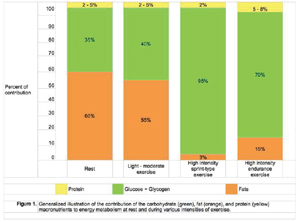 • Assess micronutrients for performance optimization and injury prevention. • Begin to lay the groundwork for in-season priorities by assessing the athlete’s in-season body comp history. • Push early calories, with the goal of taking in 50 percent of daily calories by the completion of the lunch meal. • Assess energy intake from beverages, condiments, and empty calories. • Evaluate the frequency and quantity of fried food consumption, and encourage switching to grilled, baked, and roasted alternatives. • Recommend eliminating junk food late at night and train the body to be hungry earlier in the day. • Add high-fiber options to dinner, such as whole fruit, side salads, and vegetables to enhance satiety. • Advise stocking the pantry with sensible snacks to satisfy late-night cravings. Decreases everywhere. When an athlete has a decrease in both lean mass and body fat, an immediate response is needed to prevent negative performance repercussions. This test result can also be a red flag that the athlete is using stimulants. • Add peanut butter, cheese, guacamole, and two-percent dairy products for weight support. • Add 100-percent juice or two-percent milk to meals, and drink less water. • Snack on trail mix and higher-calorie (300+ kcal) energy bars. • Never go to bed on empty. Have a snack of cereal and milk, peanut butter and jelly, ham and cheese on a bagel, or other breakfast food. • Reinforce a minimum of four meals per day plus customized recovery. • Maintain structure in the day and review sleeping habits. • Encourage adequate energy and protein intake to fuel recovery. • Present the athlete with cost-effective shopping lists and meal ideas. • Give realistic goals and a timeline for returning to the previous fitness level. • When dealing with vulnerable athletes, remind them of previous success and reinforce healthy training and eating patterns. Without downplaying data, remind athletes not to overvalue their baseline. Softball Success. Team data can be profoundly influential for a coaching staff when it comes to eating during the season and on the road. The information drives home the importance of in-season nutrition and the cumulative effect of poorly chosen food patterns. One team we’ve worked closely with is softball. Following a productive off-season, the team entered a new season primed for success. The Aggies advanced to the super regional, but ended the season in disappointing fashion, having not achieved the goal of advancing to the Women’s College World Series (WCWS). • What are you interested in knowing more about in nutrition? • What do you struggle with most in-season that pertains to nutritional intake? • When do you feel most fatigued? • What did you like and dislike about travel nutrition last season? • What can the nutrition staff do to help improve your performance? • Improve nutrition on road trips by following optimal menu choices provided by the nutrition staff and foregoing all soft drinks. Tables were pre-set with water at each place setting. • Prioritize recovery nutrition. Athletes were charged with doing this individually after workouts, while postgame meals were pre-ordered by the operations staff. We also tweaked in-season conditioning to promote preservation of ideal body composition. When body comps were completed before the following season, 71 percent of team members had preserved or increased lean mass while controlling body fat (the percentage would have been higher, but some players were injured and did not follow a normal training and eating schedule). It showed on the scoreboard, too, as the team advanced to the WCWS for the first time in nearly 20 seasons. Before the tournament, we shared these results to bolster the confidence of our team and coaching staff. Following that season, the athletes wanted to further their body comp success by learning more about how to make good nutrition choices on an everyday basis. Each player met with the nutrition staff for one-on-one sessions and the team enjoyed a grocery store tour focused on their areas of interest. At the end of the off-season, the team’s body comp report card showed a gain of 62 pounds of lean mass spread across the 17 players on the roster. Body fat percentage remained in an optimal range and several athletes smashed individual goals. All their hard work paid off, as the team advanced to the championship game in the WCWS the following year and won the Big 12 regular season and tournament titles. Their Own Culture. Baseball players are a unique breed when it comes to nutrition. They range from the very vain, highly developed power athlete to those with a Babe Ruth-like physique. Supplements and stimulants are a part of the culture. In addition, superstitions and rituals often take precedence over nutrition. Pregame meals are tracked alongside wins and losses. No matter how popular a menu is, if it doesn’t lead to wins, it will be replaced. We work with our baseball team in the off-season in several targeted sessions, which we map out in collaboration with the coaching staff. We go over sports nutrition basics, hydration, carbohydrates, protein, fat, maximizing recovery, and gaining lean mass (see “Baseball Sessions” below). We bundle these educational efforts with team meals to make the meetings more social and interactive and less like lectures. What better time to talk about the benefits of good nutrition than when a team is making food choices? Standout achievements in body composition are recognized by the coaching staff. Our outstanding student-athlete in 2007 was a catcher who needed to lean out to improve performance. Baseline DXA showed a total mass around 186 pounds and lean mass of 129 pounds, with a higher-end body fat percentage and healthy bone mass. Specific strategies centered on prioritizing quality rest, incorporating more lean proteins, and pushing early calories while tapering intake downward after dinner. Following off-season conditioning, off-season nutrition programming, and a couple of individual nutrition sessions, this athlete added more than eight pounds of muscle and dropped nine and a half pounds of fat (more than five percent of his total body fat). Nothing reiterates the value of good nutrition choices like results. Hidden Problem. Working with our track team the last few years, we had grown accustomed to seeing amazing body composition and fitness levels among freshmen. For one athlete, however, our initial body composition baseline screening showed significantly low bone mass and density. The athlete was invited in for an appointment, and screening continued as we inquired about body image and diet, looking for evidence of disordered eating. After finding nothing, I talked to the athletic trainer and coach to learn more about the athlete in question. From them, I found the missing piece of the puzzle. This athlete’s home environment was fraught with food insecurity. There was a family history of obesity, and the athlete initially began running to control her weight. She lacked confidence in her food choices and had no previous nutrition education. We started a personalized supplement regimen of calcium and vitamin D, coached her on adequate nutrition, and continued to monitor her bone density. Now, this athlete thrives in the competitive environment and is a role model for nutrition among her teammates. With encouragement, she’s become a more adventurous eater and appreciates the care given to her bone health. A simple screening and aggressive response set this athlete up for success, and prevented the development of disordered habits. As these stories show, investing time and resources in body composition testing and extracting every performance-enhancing detail from both individual and team reports can yield great results. The keys are to position your nutrition expert as a performance coach who reaches every athlete on the team, make use of the data along with athlete feedback to establish feeding guidelines, prioritize nutrition education, and deliver appealing, dynamic nutrition sessions. Optimal nutrition benefits student-athletes’ health and wellness and, ultimately, fuels your win column.